Thank you for your interest in The Marine Room, a timeless tradition in San Diego for almost a century. 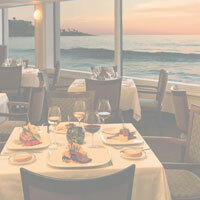 Our award-winning restaurant is owned and operated by La Jolla Beach & Tennis Club, Inc., which offers a variety of employment opportunities in La Jolla, California across two hotel properties and three restaurants. We pride ourselves in providing excellent benefits and an inspiring work environment for all its employees. Be a part of something special. Please take a look at our current job openings at The Marine Room to read job descriptions and apply.